sterling silver, compass, acrylic 81/2"x5/8"x5/8"
This Torah pointer has a compass on one end. It can be used as a tool to help you find east (towards Jerusalem), so you know exactly which direction to face when praying. It can also be a metaphor, referencing the Torah as a map, meant to help you find your way. 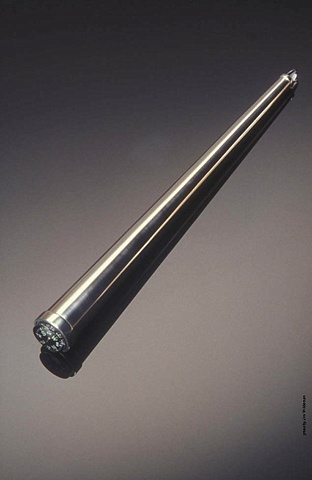 This Torah pointer is part of the permanent collection of The Jewish Museum in New York, NY.